It is a good time to be an end-user of energy whether that be natural gas, electricity, gasoline, jet fuel, crude oil or any other product you can think of. Energy prices have surpassed the lows established in 2012, a record thought to be unbreakable. While customers are enjoying extremely attractive rates, it is important to remember that the utility companies and energy marketers on the other side of those transactions are feeling pressure and responding as you might expect. With natural gas prices so low, utilities continue to retire coal and nuclear plants before the end of their useful lives. This results in fewer plants available, shrinking capacity margins and rising capacity rates from the remaining power plants. Some utilities, once proponents of deregulation and free-market forces, are now clamoring for protection from the same regulators they sought to get out from under just 15 years ago. Energy exploration companies invest billions, and are vulnerable to rapid swings in energy prices. Many are shutting down vertical rigs or fracking operations as fast as possible, and the number of companies filing for bankruptcy protection is at an unprecedented high. Falling energy prices can be attributed largely to our increased domestic production of natural gas and crude oil. Not only does the former resource fulfill our heating needs, it also serves as a fuel source for generating electricity. As the nation's daily supply has steadily grown, prices continue to slide. Exacerbating the supply/demand imbalance was this year's mild winter that led to less-than-normal heating demand and inventory levels 65% above the previous year. At current levels of daily production it would take a blistering hot summer to avoid running out of space to store natural gas. In situations like that, producers are left with few good options, either cease production or sell below their cost into a plummeting spot market. 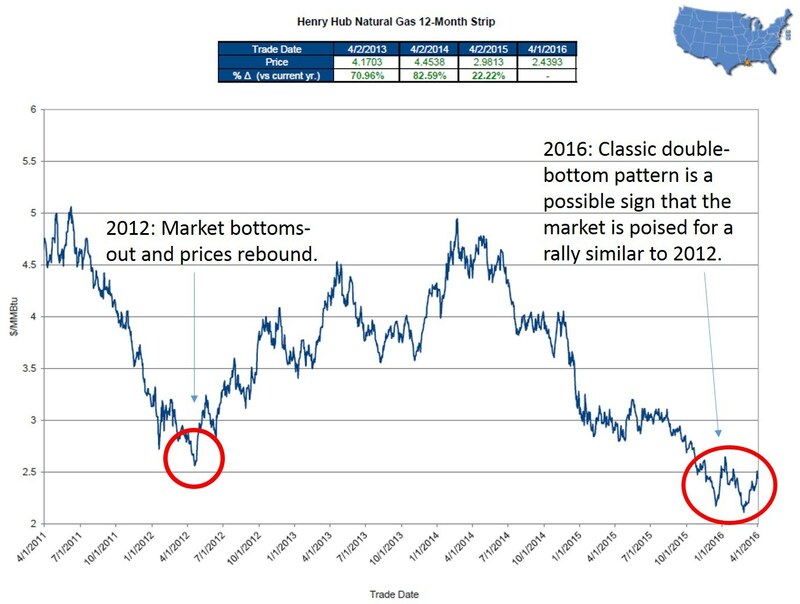 With natural gas prices so low producers are unable to recoup their costs, and as they continue to shut rigs down we may be poised for a repeat of the rally that started in April 2012. Since January 2015, over 50 U.S. exploration companies (primarily in Texas) have filed for bankruptcy as banks adjust the terms of their loans that were tied to natural gas prices. The loss of this many companies not only hurts our supply, it puts many people out of good-paying jobs. The loss is also felt in industries that support natural gas production: steel is no longer needed for rigs and pipelines, communities that grew or were built around drilling sites are in danger of becoming modern-day ghost towns. While our abundance of natural gas may continue to drive energy prices down, it is unlikely that they can go much further or will stay this low. As suppliers accelerate the rate of rig shut-downs, our stockpile will erode and the laws of supply and demand should cause prices to rally. Another bullish driver is the great incentive to move natural gas to markets where it can be sold for a higher price. As these projects become reality we will see a leveling effect on energy prices across the U.S and possibly world-wide. Numerous interstate pipelines are under construction to take Appalachian gas and send it across the country to markets that are paying much higher rates, most noticeably New York City and the greater New England area. Earlier this year the U.S saw its first export of Liquefied Natural Gas (LNG) as a supertanker traveled from Houston to Brazil. Companies have invested billions to develop LNG export capabilities and a great deal of our daily U.S. production has already been permitted to go to places like Japan, India, China and Europe. If we start to see 5-10 percent of our supply headed to places where natural gas rates are much higher, natural gas will no longer be our domestic commodity. It will become a global commodity much like crude oil, subject to a whole host of new price drivers. In the first quarter of 2016 we have witnessed a very strong correlation between crude oil prices and the equity markets. 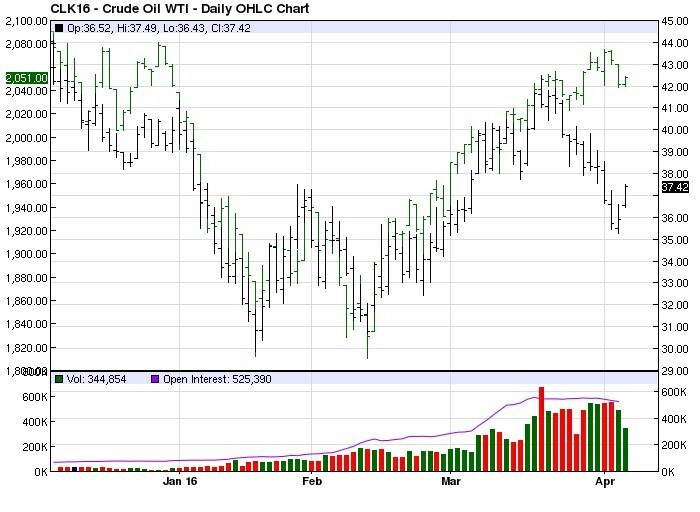 Shown below is a chart of the May 2016 Crude Oil contract vs. the S&P 500 Index. The relationship between oil and equities caught many investors by surprise, as the prevailing thought was the two should be inversely correlated, not positively correlated as shown below. Cheap energy means more money in our pockets and has long been thought of as a leading indicator for economic growthand rising stock prices. With the start of April we have seen a divergence of oil and equity prices and will be watching closely to see if the conventional wisdom starts to prevail. Regardless, it is clear that the recent events in the energy industry have had a profound impact on broader economy in the U.S. and worldwide. Independent Energy Consultants is pleased by these low energy rates and works hard to broker the lowest rates in any market environment. We take this opportunity to point out that when energy prices start to rebound it will have a beneficial impact on many other areas of our economy.